Touched by benevolent beings of the good Outer Planes somewhere in their ancestry, aasimars are viewed with either awe or fear by all who know of their celestial heritage. Hailed as scions of angels at best or otherworldly bringers of heavenly destruction at worst, there is no doubt that assimars hold a very special place in the world of mortals, and all know to be wary of their actions in the presence of an aasimar. New curses, inquisitions, and subdomains for heavenly oracles, inquisitor,s and clerics. 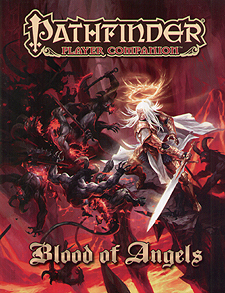 New masterpieces for aasimar bards, and the martyred bloodline for sorcerers whose celestial ancestors made the ultimate sacrifice for their beliefs. A host new traits to help make your aasimar character truly unique, as well as dozens of bodily features that distinguish your celestial character.